This entry was posted in Striketerm. Bookmark the permalink. thanks for this great terminal program. I believe I found a bug related to rs232 handshaking. It seems that the setting software enables the CTS/RTS (which is hardware handshanking) and the setting hardware enables the xon/xoff handshaking. Is there any chance you could take a look? Thanks for the awesome terminal program! It’s the perfect hybrid of Novaterm and CCGMS in one. I’ve been experimenting with UP9600 on a EZ-232 by Jim Brain with StrikeTerm 2014 Final. To get reliable results, I know that I have to use flow control. And I’ve finally got that working now but it seems I have to select “Software” flow control and not “Hardware” in StrikeTerm. In testing, I’ve connected my Mac to the C64 via USB and run CoolTerm. In the settings, I have to choose “DTR” for flow control (and not CTS or XON) to get it to send to the C64 properly. I thought “hardware” flow control was DTR/CTS and “software” flow control was XON/XOFF? Which side is correct? Hey guys, I can confirm that the software and hardware handshaking are the opposite way around in this version of striketerm. I built a modified up9600 adapter that uses hardware handshaking so I enable rts/cts on tcpser, and select xon/xoff in striketerm (instead of rts/cts). God bless! Joe. The BBS thinks you’re in ANSI mode, which is a different mode than Commodore Petscii-C/G mode. 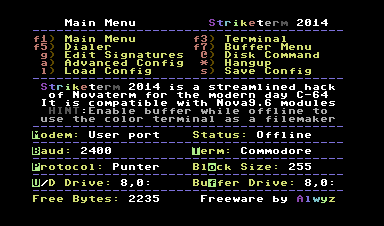 Make sure the term type in Striketerm is Commodore, and when you call the bbs and it asks you to hit delete, hit the inst/del key on the upper right of your commodore keyboard. Does Striketerm support Telnet handshaking?